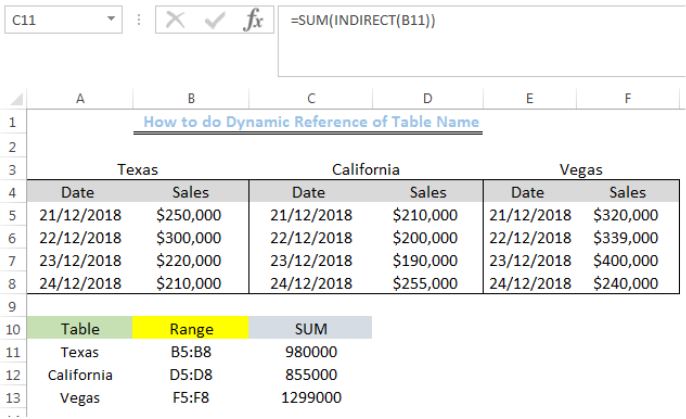 With the INDIRECT function in combination with functions like SUM and AVERAGE, we can do dynamic reference of table name to perform different calculations. This tutorial will walk through the steps to dynamically reference a set of data in other functions. We will set up the data by inserting the dates and sales into Column A to Column F as shown in figure 2. We will also name them with the three cities as shown in the figure. We will input the cities into Cell A11 to Cell A13 and place the range of the sales in Cell B11 to Cell B13 as shown in figure 3. We will sum the sales of the different cities using the formula above. We will insert this formula into Cell C11. We will press enter to get the total sales. We will use the drop-down to get the total sales for California and Vegas. We can use other combinations with the dynamic reference to the table name. 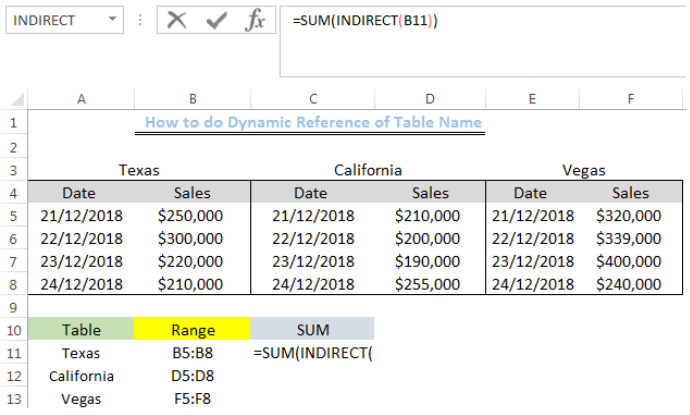 The INDIRECT function creates a dynamic reference to the table name “Texas” and returns the values of the Range for the table name, which, in this case, is “B5:B8”. The SUM FUNCTION then totals the values in Cells B5 to B8. 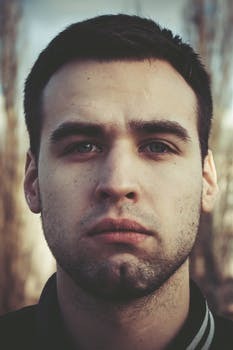 I am trying to create a VBA macro that creates a pivot table (dynamic) for a set of data. The data size will change with each database I bring up so the pivot table range needs to be dynamic. 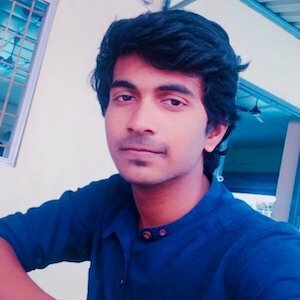 I have created a table using Insert/table. Works fine, now I want to reference the table in a 'vlookup' formula in another sheet of the same workbook. 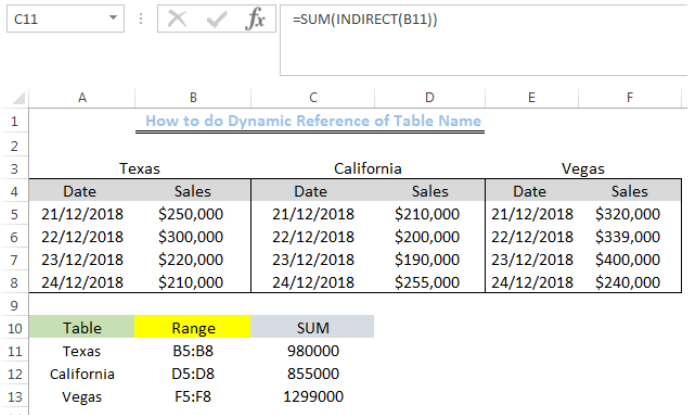 How do I use the table name in the 'table_array' argument of the formula ? Thanks.